As far as I recall I have yet to post an entry about eating somewhere, but when I saw this snapshot I sent to the Thrifty Sifter in my phone, I figured I HAD to post about it. Hill Country Barbecue is my favourite barbecue joint in New York City. 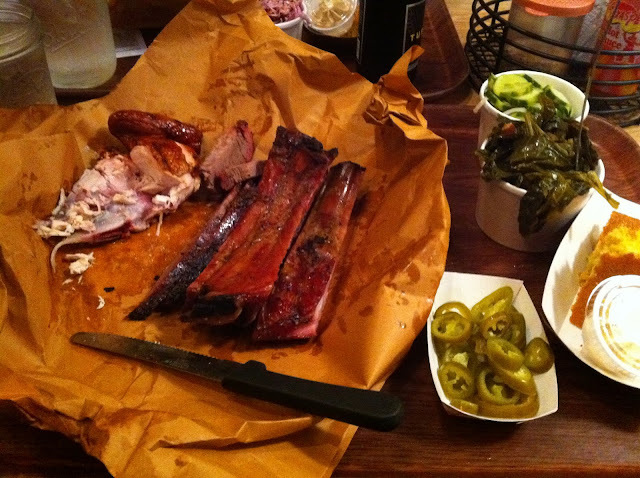 They have their own pit, they do all their own meat, and from experience it is absolutely authentic hill country fare. My mother lived in New Braunfels, TX for years and this is the real deal. Some nights I dream about those babyback ribs (now that I can eat them). If you want a meat hangover, Hill Country Barbecue is your place. Your soundtrack for this entry: Nuclear Whales - Casbah Shuffle.